Configuration: Displays the PaidSystem configuration form. 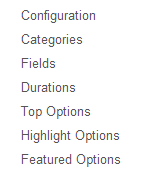 Categories: Displays the AdsManager categories and their prices. Fields: Displays the AdsManager fields and their prices. Durations: Displays the Ad duration options. Top Ad Options: Displays Top Ad options. Highlight Ad Options: Displays Highlight Ad options. Featured Ad Options: Displays Featured Ad options.